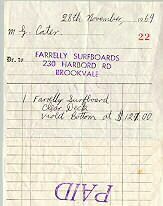 1970 Farrelly Twin Fin 6 ft 1 "
Foam blank with 1/8 inch redwood/glueline stringer?, red pigment volan laminate with 1/2 inch rail lap. Foil deck to tail patch. Fin patches? 6 1/4 inch x 4 inch base @ 5 1/2 inches. 6 3/4 inch x 4 inch base @ 5 1/2 inches. 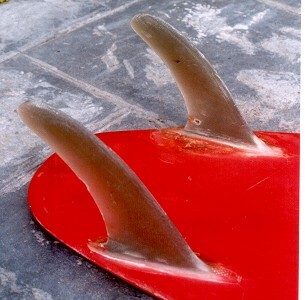 Note the fins, probably original, have been heavily damaged, possibly trimed and reinforced. 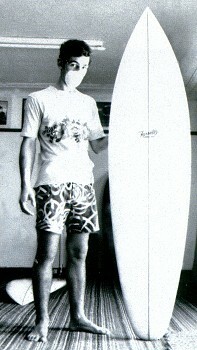 # 71 Walsh 5 ft 4"
#461969 Farrelly, Square tail 6 ft 4"
#541971 Farrelly Pop-out 5ft 5"
Note similarities in template to #214.